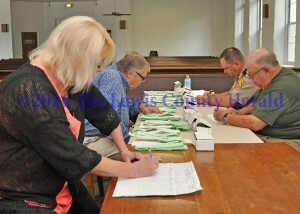 Members of the Lewis County Board of Elections conducted a recanvass of the presidential primary election. Pictured, left to right, are County Clerk Glenda Himes, George Plummer, Sheriff Johnny Bivens and Grover Evans. Bernie Sanders’ campaign requested a recanvass of the vote totals in last week’s Kentucky Democratic presidential primary in which unofficial tallies show Sanders lost by fewer than 2,000 votes to Hillary Clinton.